If you follow me on Instagram, you may have seen this picture. Yemi over at Great Lengths tagged me to participate in the #LetsGrow2015 mini-challenge. This month’s theme is “Something New” so I decided to try my perm rods that were sitting in the back of my closet. My hair was very soft this week, leaning towards over-moisturization. I even noticed some breakage in the front section. The same section that I proudly showed in my Edge and Nape update. 🙁 Some people don’t need to worry about protein so much. Unfortunately, I am not one of those people. I definitely need to pay attention to how my hair is behaving. Normally, I would do my protein treatments once a month. So I was due for one in early Feb. My hair said no and I had to do it this week. Here’s how it went. (2) Pre-poo/Hot Oil Treatment with warmed olive oil, coconut oil, and honey. Covered my hair with a plastic cap and kept on without heat for 30 minutes. (5) Deep conditioned with Creme of Nature Argan Oil Intensive Conditioning treatment + leftover pre-poo + castor oil. Covered with a plastic cap and stayed under the dryer for 30 minutes with medium heat. (6) Rinsed with cool water and followed with an ACV rinse. (8) Set hair with perm rods. Dried for 1 hour under the hooded dryer and left them in overnight. Using the perm rods was a STRUGGLE. I could not get them tight to the scalp. With roller sets using magnetic rollers, I need to have the ends smooth on the roller and the roller tight to the scalp. If it’s not tight, puffy roots here I come. I used some flexi-rods towards the back of my head and I was able to get those tight. I was also worried that it wouldn’t dry on time. Luckily, my hair was dry in the morning. The curls were very tight. I thought I looked like little orphan Annie. Not the one with Quvenzhané Wallis. The one from the 80’s. I didn’t get pics of when I separated the curls because I was rushing for work in the morning. I ended up just pinning it up and wearing it like that. My hair felt much stronger and not as stretchy. It’s also very moisturized. So apart from the curls, this wash day went pretty well. Have you used perm rods before? Any tips or best practices? I have used perm rods in the past but they were difficult to use and the rubber clasps kept cutting or coming off. Glad to hear your breakage has reduced. I also like protein conditioners. I’ve used perm rods before and I also struggled with having them tight to tbethe scalp, but the curls weren’t too bad. Its great that your wash day turned out good. Your pinned up style looks good! I am so weary of perm rods, I don’t like manipulating my hair too much when its wet. That is very understandable. I haven’t been able to air dry my hair since it’s been texlaxed. I may start again though. I actually LOVE your curls! Then again—I’m a perm rod super fan! And that updo is LEGIT! !. Start rolling from the roots down. I get the best tension and smoother roots. I also double strand twist the section first to make take down easier and give my curls more volume. 3. Set on damp hair—this is a personal preference for me. I hate detangling or setting soaking wet hair. It wrecks all kinds of havoc and breakage. 4. Be mindful of the direction in which you set the rollers. That’s the direction your curls will go in and it will determine the shape your style will have. 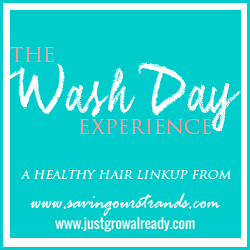 Thanks as always for sharing your #washdayexperience chica! Thanks for the tips, KLP. I will definitely try them next time. Still working on my perm rod set but one thing I learnt was getting the opening part to be in one direction so I can pull it very tight. That held the rod close to the scalp. The band also goes under the hair for a firmer hold. I have some perm rods but haven’t used them yet. Your curls came out great. How was it sleeping in them? Thanks, Tomes. I found the perm rods a bit difficult to sleep in. This is strange because I normally sleep in magnetic rollers without any issue. Your hair looks amazing. I honestly don’t know whether my hair loses protein every second but lately I have had to use protein every week for almost 4 weeks now. My hair was all over the place but when I used mayonnaise and egg plus oil it reduced. It felt stronger. I used that for two weeks. I am still using mayonnaise and coconut oil every week because I am afraid that my hair would start breaking again. Do you think I would suffer from protein overload? I always use a moisturising deep conditioner after rinsing off the protein treatment. No wonder this was one of your top posts for 2015. I love the curls. Protein is a must for relaxed hair, but you know it breaks my end and make my hair dry and frizzy! I focus more on moisture for my natural hair. My hair did feel better after I co-washed. Using heat was helpful too. Thanks, Nerline. I’ve gotten a bit better with perm rods. I may do another post on it.